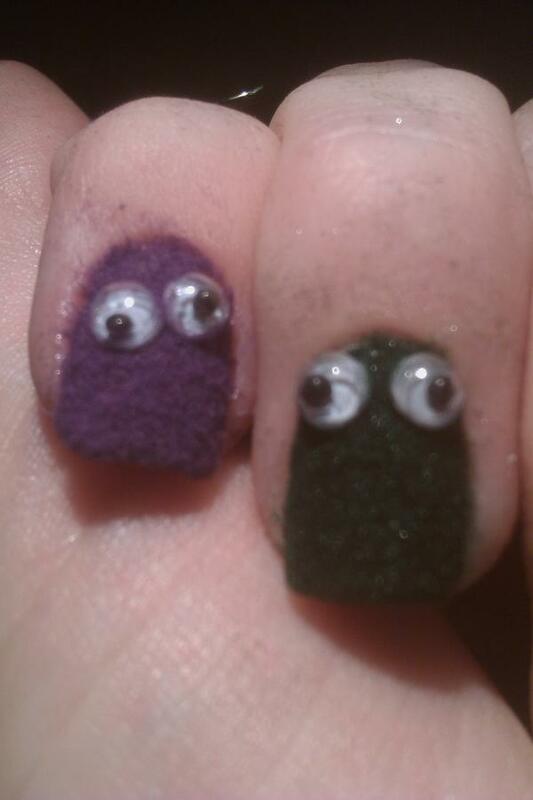 Sometimes you get an idea for nail art and it goes better than you'd even imagined. This is the first time that's ever happened to me. Somehow over the summer I got the idea to turn 'sweater' nails into little monsters for Halloween...and...well...I giggled for hours! I wish I could say I planned the faces...but I didn't. This sorta happened 'on its own'. Makes it even better, I think! Oh no! He's getting closer!!! Nooooo!!!! That's my best nail! Don't eat it!!! If you'd like to do this yourself sometime (a Cookiemonster nail would be awesome! ), it's really easy! Flocking powder can be found in the scrapbooking section of craft stores. Find the best match among your polishes and paint normally. I used Wet n Wild Disturbia, Sinful Colors Last Chance, Finger Paints Go van Gogh!, and Sally Hansen Grass Slipper. I put a small dot of nail glue where I wanted each eye on one nail at a time, and quickly placed the eyes over the glue, pressing very gently. I let the glue dry for about 10 minutes before the next step. To apply the flocking, I poured some of it into the lid of each container, about 1/4" thick and broke up any clumps. I coated one nail at a time with a thick coat of clear polish (carefully avoiding the eyes) and dipped it into the matching powder, pressing it gently into the edges with my cuticle pusher. I lightly smoothed the flocking with a finger. This is when I knew it was working! I let it dry before adding mouths and teeth with my dotting tools. It was VERY hard to get all of the loose flocking powder and clear polish off my skin, but I managed with my cuticle pusher and some lotion (keeping it away from the fuzz) and got it pretty clean. These guys made me smile each time I looked at them! They felt endlessly weird though! Way better than I'd expected! ....but they had to go, as much as I'd miss them. I had almost as much fun removing them as I did wearing them! I'm melllllttiing...mellllting...oh what a world, what a world! AAAAAAHHHH!!! His EYE!!! GET IT OFF MEEEEE!! These were just too much fun!! Hope you got a laugh out of them too! Happy Halloween!! ahahaha oh my god i literally started laughing out loud at the removal pictures! hahaha the purple one's face, i just can't. i love these so much. Thanks! :D I giggled at them all day. I think this is the first nail post I've laughed out loud at!! Can I pin this? This is sooo amazing! lol Awesome! Thank you! :D Sure, you can pin it! Textured nails make my head hurt but OMG so cute and I *LOST IT* at "what a world what a world." lol Thanks! Yeah, I was cringing at how they felt pretty often...especially those eyeballs.